Heyrex is a monitor that fits to your dog's regular collar, building a profile of your dog's behavior. It achieves this by recording every aspect of your dog's activity in real time, transferring the information to the Heyrex receiver every time your dog comes within range. 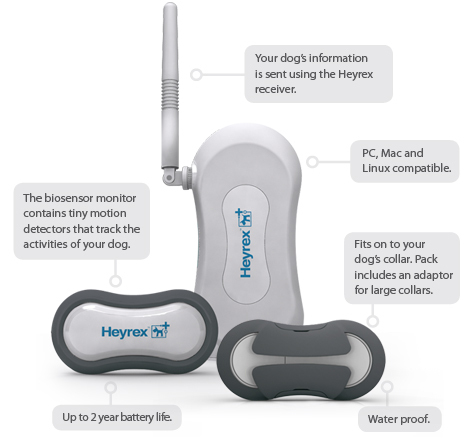 The Heyrex monitor collates data related to your dog's behavior: exercise levels, scratching, sleep quality and other behavioral or health issues. It uses wireless technology to transmit that data from collar to receiver, sending you automatic notifications when behavior changes, improves or indicates a health problem. It provides weekly and monthly summaries in user-friendly graphs that are simple to interpret. It even has a diary function where you can record key milestones in your companion's life. Heyrex is totally safe and ergonomically designed, not to mention waterproof and durable. Your dog won't even notice it's there. It takes just minutes to set up and doesn't require charging, so you can start monitoring your dog as soon as it arrives. Why do I need one for my dog? Dogs can’t talk, but they can communicate. The way their tail wags, how they droop their head or raise their paw. All are simple identifiers of mood. But it’s more complex than how your pooch greets you at the end of your day. Heyrex is designed to be used over your dog’s lifetime, from puppy to pensioner. It builds a comprehensive profile of your dog’s behavior. The longer you monitor your dog, the more comprehensive the profile. So you can identify health or behavioral issues and act decisively if they occur. With all the rushing about in our time-poor world, it's easy to miss a change in your companion's behavior. It pays to consider the consequences. New Zealand Vet, Dr. Mark Edwards, BVSc MRCVS has been using Heyrex on his family dog, Choco for over a year. He has prepared 20 common issues faced by pet owners that Heyrex can assist with. Regardless of age, Heyrex is an ideal monitoring tool for pet parents. Puppies often suffer from separation anxiety, crate training, bedtime issues, itches and getting the right amount of exercise not to mention what they are doing when you are not there! Adult dogs can have issues around weight, lameness, exercise tolerance, allergies, stress and sleep. Geriatric dogs have more age related issues such as disease, arthritis and joint issues, canine dementia, treatment response and day to day changes in behavior. All dogs have common complaints Heyrex can assist with monitoring those like the small changes that go unnoticed that could lead to something serious, preventative health management and recording activity from one month or year to the next. Does your dog keep running away? It may not be getting enough exercise. The Heyrex monitor tracks your dog’s activity in real time so you can ensure it’s leading a fit and healthy lifestyle. We know you care for your dog. We want to help you give it the attention it deserves. Heyrex measures activity levels, mobility, scratching, resting patterns and sleep disturbances. Information that helps you identify any number of behavioral and health issues your companion might face; from fleas to separation anxiety. Even exercise levels. Heyrex keeps monitoring even when you’re not there, so you’ll know how your dog is doing regardless of whether you’re at work or on vacation. All you need to do is log onto the Heyrex website with a smartphone, tablet or desktop, and all the information you need is at your fingertips. You can even have it sent to your vet! How does Heyrex show me this information? The Heyrex system analyses data collected from the monitor in real time. It then presents that information in easily digestible infographics, so you can see any changes as they happen. Simply log onto the Heyrex website on your desktop, tablet or smartphone. Heyrex sends automatic notifications to your email if your dog's activity changes in a manner suggesting a change in its wellbeing. You can then decide whether to visit a vet for further diagnosis. So you have the peace-of-mind that even if you don't notice a change, Heyrex will. Experiential Temperature allows you to see what temperature your pet has experienced during a 24 hour period. Note: This is not your pets' core body temperature. It is the temperature your pet experiences' and it will often fall somewhere between body temperature and air temperature. This can be used to monitor a number of things, including how cold a pet gets at night or during the day in the cooler months especially if they are outside. It can also be used before, during and after exercise as well as in those warmer months or heatwave times. Heyrex isn’t expensive. We understand that dogs are expensive enough already, we simply want to help give it a voice. To begin monitoring your dog you’ll need the Heyrex Starter Pack, check out your local pricing in the store. Have more than one dog? Additional Heyerex monitors use the same receiver as your initial monitor. Check out your local pricing in the store. If you need to know more, please visit our Help section where we provide useful information. Or you can contact us by filling in our contact us form. How do I sign-up to Heyrex? 2. Follow the simple instructions and register your dog. 3. Complete your online profile. Easy. Heyrex even has an email helpline to provide support should you have any difficulties setting up! Has Heyrex been tried and tested? Heyrex has been developed over many years by statisticians, veterinary professionals and technology engineers. Heyrex has been tested in a number of veterinary and home pet environments as well as in research centers and as part of formal clinical trials. Heyrex’s performance was tested against video recordings of dogs at the Waltham Institute, UK. Heyrex has been used for double-blind clinical trials in Australia and New Zealand, by pharmaceutical companies and by Massey University Veterinary Sciences School. Heyrex was presented to the World Small Animal Veterinary Association Conference in 2011. Heyrex has been used in the monitoring of post operative recovery, skin treatments and behavior in the USA, Australia and New Zealand, as well as by everyday dog owners who love their pet. Heyrex Monitors have been used at the Massey University Veterinary Teaching Hospital for several research projects. "We have been keeping a close watch on Moose, our very first puppy. There's no question - Heyrex is a great tool to help keep watch over your best mate 24/7." "I love checking on Charlie while she is at doggy daycare, I had no idea how active and happy she was while she was there."